Siri Mitchell graduated from the University of Washington with a business degree and worked in various levels of government. As a military spouse, she has lived all over the world, including in Paris and Tokyo. Siri enjoys observing and learning from different cultures. She is fluent in French and loves sushi. But she is also a member of a strange breed of people called novelists. When they’re listening to a sermon and taking notes, chances are, they’ve just had a great idea for a plot or a dialogue. If they nod in response to a really profound statement, they’re probably thinking, “Yes. Right. That’s exactly what my character needs to hear.” When they edit their manuscripts, they laugh at the funny parts. And cry at the sad parts. Sometimes they even talk to their characters. Siri wrote 4 books and accumulated 153 rejections before signing with a publisher. In the process, she saw the bottoms of more pints of Ben & Jerry’s than she cares to admit. At various times she has vowed never to write another word again. Ever. She has gone on writing strikes and even stooped to threatening her manuscripts with the shredder. For a young society woman seeking a favorable marriage, so much depends on her social season debut. Clara Carter has been given one goal: secure the affections of the city's most eligible bachelor. Debuting means plenty of work--there are corsets to be fitted, dances to master, manners to perfect. Her training soon pays off, however, as celebrity's spotlight turns Clara into a society-page darling. Yet Clara soon wonders if this is the life she really wants. Especially when she learns her best friend has also set her sights on Franklin De Vries. When a man appears who seems to love her simply for who she is and gossip backlash turns ugly, Clara realizes it's not just her marriage at stake--the future of her family depends on how she plays the game. 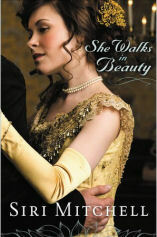 If you would like to read the first chapter of She Walks in Beauty, go HERE. Of course the name of the band has completely left my mind at the moment. If anyone knows the band I'm talking about, feel free to supply me the information. For me, it has been a while since I've written on this blog. It's been about as long since I've written on a manuscript. 2012 proved to be a good year, full of changes and full of challenges for me. I believe it is the combination of these changes that caused me to lose my focus and to slip away from writing. As we go into the new year, I'm optimistic that my old self will return. That I'll rise early and write. That the issues I dealt with in 2012 will dissipate. I've always enjoyed reading historical novels. As a child I actually imagined living in the mid 1800s. My grandmother fed my imagination by supplying me with hoop skirts and costumes of the age. She also granted me endless hours typing on her electric typewriter. I fell in love with Gone With The Wind and imagined myself writing my own book one day. I'm currently dabbling with Time Travel. I've renewed an old manuscript by adding the Time Travel element. 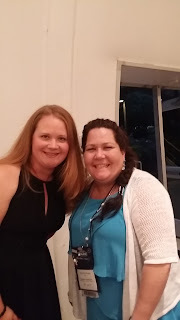 I was curious to see how it would be received and I'm happy to report my manuscript The Bridge Between is a finalist in the Romance Through The Ages Contest! The first round judges were kind and generous in their review of the manuscript. It takes time to read pages of someone else's work and give your honest opinion. I appreciate the feedback I received and have considered it as I move forward in completing the revision. Check back for more updates. And until then, write on! I may be about 15 days late in greeting the new year via this blog, but I waited to write as I wanted my first post of the new year to be meaningful. About 8 years ago, I returned to my day job after taking a long maternity leave. I'm sure I've written about being a stay at home mom after my daughter was born. While I was glad to have a job to return to, I missed being at home with my child. But I held my head high, blessed to have an income when many others may not. I returned to work and was reunited with many old friends. I also met many new people. Employees come and go with my company as I'm sure they do with yours. We move from office to office and from state to state. Change is the norm. Embrace it, or be miserable. I like to be happy so I embrace.